From the mobile video explosion to emerging social platforms, 2016 has brought many content-related developments that affect the public relations industry and the work PR people do every day. A look at the year in review offers some clues as to what 2017 year has in store. 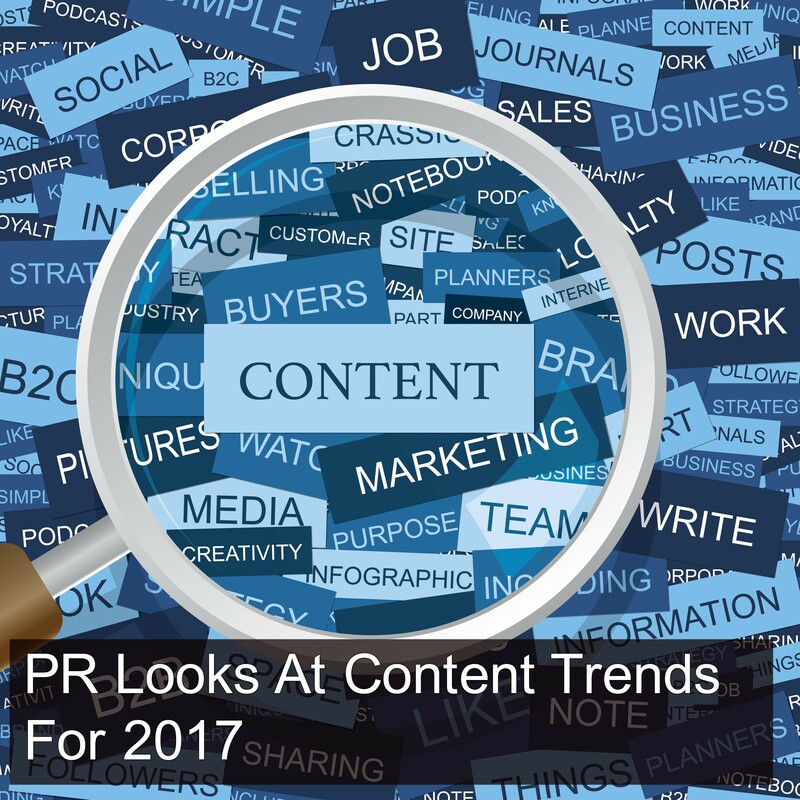 Here are five content predictions for 2017 that all PR people should note. Video goes vertical. 2016 had seen a spike in the popularity of video, and one reason is that vertical platforms like Snapchat and Periscope are popular for smartphone video consumption. Beyond the vertical format, users now have so many different ways to watch video, and the hunger for great video content is so great, that PR agencies are investing heavily there. Agencies are having to think of new, creative ways to use video for selling a product or message. This entertaining video from Eloqua uses animation to keep the target audience engaged. And as PR people continue to master the medium, the emphasis on video will only grow. Mo’ mobile! 2017 will see more advances in mobile, including more efficient interfaces for a better and more customized user experience. One example is from athletic shoe and appeal store Finish Line. According to a study by the Pew Research Center, of people getting news on desktop or mobile, more prefer mobile (56% to 42% who prefer desktop). The roaring success of Pokémon Go means we’re ready to embrace VR and augmented reality, so get ready! Long live long-form. Even though it might seem like everyone wants snackable news or nuggets in 140 characters, there’s still an audience for long-form content. If the content is good enough, people are willing to stick along for the ride. One of the year’s very best pop culture pieces can be found on Bill Simmons’ new website The Ringer, which often publishes long-form pieces about sports, pop culture and politics. Site editor-in-chief Sean Fennessey recently wrote a long-form examination of the current state of the film industry through the eyes of filmmakers, industry insiders and experts. At more than 6500 words, the article is a very long read for any medium, let alone online. But Fennessey’s piece received very positive feedback, and if you’re a fan of movies and pop culture, you didn’t want it to end. Content gets “real.” We now have access to an endless stream of content, where we want it, when we want it. This means that PR agencies are expected to produce more content across a wider range of platforms than ever. But while more outlets means more opportunities for placement, there are still some obstacles, like fake news. It’s possible that PR or marketing staff would be tempted to get “creative” as an easy way to get press, but our hope is that legit news sources will keep everyone on the straight and narrow. The Washington Post points out several ways to detect fake news, starting with the site of origin. For PR people, the challenge is to create high-quality content that’s compulsively shareable, but that doesn’t fall back on clickbait or worse. Content will be automated. We have mixed feelings about this one. The Content Marketing Institute predicts that, with the right technology finally in place, promotional and even journalistic content is poised for automation. We’ve already heard about pilot efforts in this area in journalism; earlier this year Associated Press used “robot journalists” to write earnings stories. Artificial intelligence is also finding its way into content marketing, which means it’s only a matter of time until data-driven storytelling gives way to automated content creation. But despite the advent of AI, quality content will always need to be relevant, compelling, and informed by insight, which can only come with the human touch.